My Latitude wipers by Rain-X has arrived and it couldn’t arrive at a better time! My previous set of Latitude wipers lasted me a good three years, but has finally succumbed to the harsh heat of summer and relatively wet winters, courtesy to southern California climate. I like these wipers because they are well made, heavy duty and contours with the curvature of the windshield. Everytime it wipes, the Latitude blades act as a mini squeegee and squeezes out excess water or snow that piles up on the windshield as you drive. I’d say it has a better practical use in snowy climate because of the squeegee effect but will be just as effective in climate that endures heavy rainfall. This is particularly important since a good portion of my northern California road trip, especially in Humboldt county, will sustain a heavy amount of rain in conjunction with thick rolling fog blankets during the duration of the trip. I’ve replaced the front two blades but took the old passenger side blade and used it for the back wiper – I haven’t changed the back wiper since I got the car, which is 6 years going into 7. Installing the blade is a cinch and requires simply unhooking the stock OEM blades from the factory J-arm hooks on the factory wiper and replacing it with the Latitude blades, snapping it into the corresponding sockets. 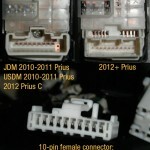 The kit also comes with adapters for vehicles that require it. For Acura RSX models, you’ll need a 24″ blade for the driver side and a 20″ blade for the passenger side blade and rear wiper. To maximize my preparation for the trip, I’ll also be applying Rain-X rain repellent before we embark to Shelter Cove and beyond.